I’ve read all the fairy tales. I know what’s supposed to happen when your fairy godmother comes to save you. You get the glass slipper. You go to the ball. You win Prince Charming. Well don’t believe a word of it! I can tell you from experience that making a wish can be devastating. It can change your whole life and your fairy godmother is no help putting it back together again. All I said was “I wish Chase wasn’t Village Bailiff anymore.” That’s it. Sounds innocent, doesn’t it? And BLAM! There I am a strange place trying to make the impossible happen with my fairy godmother telling me it's my own fault for wishing. The one thing I had going for me – my husband, Chase Manhattan – was suddenly a different person who didn’t remember that we were married. He didn’t want to be the Village Bailiff anymore. He just wanted to have fun jousting and flirting with the pretty fairies. Which is where all this started. Now I'm supposed to get him to help me solve the murder of Apple Blossom the fairy while I make him fall in love with me again. And this has to happen while Chase is still with Princess Isabelle, as he was when we'd first met, and I am scrounging for a job and a place to live at Renaissance Faire Village because I'm not director of the Art and Craft Museum anymore. To make matters worse, Canyon Britt - the man I hired to help Chase is now Bailiff and thinks he's in love with me. Things are so complicated. I'm not even it's possible to do everything my fairy godmother says has to be done to go back to my life again. But I can promise you one thing. If I get through this, I’ll never make another wish again as long as I live! Win a print copy of Fatal Fairies, Renaissance Faire Mystery #8 by leaving a comment with your email here. The winner will be chosen and notified within 24 hours. Huzzah! Joyce and Jim Lavene write award-winning, bestselling mystery and urban fantasy fiction as themselves, J.J. Cook, and Ellie Grant. Their first mystery novel, Last Dance, won the Master’s Choice Award for best first mystery novel in 1999. Their romance, Flowers in the Night, was nominated for the Frankfurt Book Award in 2000. They have written and published more than 70 novels that are sold worldwide for Harlequin, Penguin, Amazon, and Simon and Schuster. They have also published hundreds of non-fiction articles for national and regional publications. They live in Midland, North Carolina with their family and their rescue pets—Rudi, Stan Lee, and Quincy. I love the work of these two talented writers—thanks for the chance to win a copy of Fatal Fairies! You are my winner! Thanks for being here! I love the blog post. Nice to start the say with a smile. Well, I don't see how THAT wish brought about THOSE results but I guess I have to read the book to find out how it all came about! Enjoy the blog entry. Guess that making wishes can be hazardous. Love to win a copy of book. This sounds like such a fun book. So many variations on the "I wish I had a different life" theme. Maybe you should be happy with what you have. Thanks for the giveaway. A lot of changes for one wish, sounds intriguing. Thanks for the contest. janet at monstercreed1@yahoo.com. The story is good fun. I enjoyed my ARC. I thoroughly enjoyed Fatal Fairies! 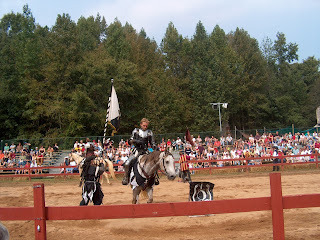 Love the pic of Joyce and Jim at Ren Faire! What fun. Fabulous thank you. Sounds like a book I would enjoy. Thanks for the chance. Sounds like a fun read! Thank you for the opportunity to win a copy! 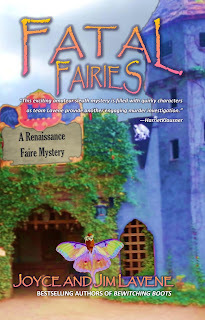 Huzzah, I love your Ren Faire mysteries and recalcertant Fairy God Mothers! Looking forward to this release! Thanks! Gee, what's a fairy princess to do? All I said is let's get this thing going. Make something happen. Now look. That fairy godmother took it to heart and acted on the first wish she heard. Who knew her hearing was that good. And so close to retirement too. Oh well. :) Thanks for this opportunity. Thanks for the chance to win. I am enjoying getting to read all your different series. It sounds like it could be challenging to have a fairy godmother---but I'd sure like to try. Sorry for the delay everyone - out of town and no internet. skorman is my winner. Thanks for being here.